Leading Exporter of metroealth suppository from Navi Mumbai. 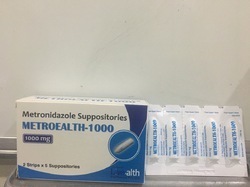 The name of this medicine is Metroealth 500mg or 1g Suppositories contains a medicine This belongs to a group of medicines called antibiotics. Packaging Details: 2 x 5 suppositories in a printed carton.